We recently added an exciting new product line to our library of resources. 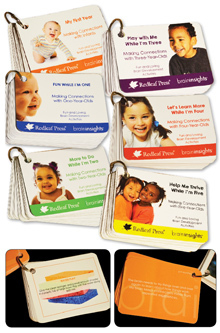 Brain Insights cards are pocket-sized sources of big fun and learning. Created by Deborah McNelis, each age-specific set of Brain Insights cards offer 40 brain-building learning activity ideas to jump-start interactive play anywhere throughout the day. Deborah is passionate about creating awareness for the critical early years of childhood. Her goal is to help everyone—parents, caregivers, educators—gain an understanding of early brain development and realize the impact we can all have in children’s lives. Read this month’s Author Spotlight to learn more about Deborah and her line of Brain Insights cards. Your Brain Insights card sets boast 40 brain-building activities each—that’s a total of 240 activities! How did you think up all of these engaging ideas? The process of developing the activity packets was pure fun! I love being creative and so enjoy making learning fun. Many of the activities are ideas that I used with my own children and children that I enjoyed early in my career as an early child educator while teaching preschool and kindergarten. Some of the activities were developed first and then the Brain Insight bit was added to explain in what way it supports brain growth. Other cards were developed due to an important aspect of brain development that it is critical that adults understand, so an activity was created to promote that aspect maturation. Of all of the activity ideas shared in the Brain Insights cards, do you have a favorite? Of all the questions, this one is the most difficult to answer—but it is a fun one! There are so many that I like, and for different reasons. But—if I have to choose one—I would say the Jack-in-the-Box activity from My First Year: Making Connections with Infants. Who are Brain Insight cards for, and what edge do they have over other similar products? Since 90% of brain growth happens in the preschool years, this series of brain packets is designed for early childhood educators. The packets are uniquely designed to provide a very easy, quick, and fun way to access interaction ideas. This series is preferable to other activity books or guides because of its ease of use, but in addition, it provides explanations of how brain development is enhanced through the suggested activities and interactions. Busy educators get the “what to do” AND the “why to do it” right in a little packet they can have on hand at any time! What is the most important thing caregivers and educators should do to best support young children’s early brain development? While there are numerous things that are critically important for supporting the development of a young brain, I would say establishing a predictable caring relationship is most essential. From infancy, it is essential to a healthy brain and overall development that a child has a consistently responsive and nurturing caregiver. When a child’s needs are met with loving predictability, this begins the optimal wiring of the pre-frontal cortex, which is the area responsible for essential skills in life of imagination, executive function, and self-regulation. Children who learn early that they matter and that there is someone there for them are children who begin with the best start in life. How did you get your start in early brain development? That thought has given direction to my entire career. I wanted to learn all I could to help children and wanted to start as early as possible. So, I got a BS degree in early childhood education and taught kindergarten and preschool. I then started doing workshops to promote parental involvement in education and started a community-based organization called Family Network. I then coordinated a family literacy program for several years and taught in the early childhood associate degree program at a technical college. I also earned an MS in education. It was during that time that the brain development research was coming out. I was beyond excited that the world would finally know and understand the critical impact of the early years. The Wisconsin Council on Children and Families had a brain project to create awareness and understanding, and I became one of the brain specialists for that project. Funding for the project ended, but my passion to make this common knowledge did not end, so I founded Brain Insights, LLC. My goal through this company is only to reach . . . EVERYONE! Children need EVERY adult who is going to influence their lives to understand what their brain needs most! 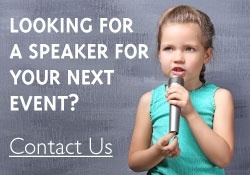 With this goal, I do speaking engagements to a wide variety of audiences throughout the country. I have blog (Early Childhood Brain Insights) and an e-newsletter. I created The Brain Development series of packets for parents, Naturally Developing Young Brains, the Love Your Baby App, and now, this new series with Redleaf Press for early childhood professionals. It is always great fun to be working on new ways to ensure this information is finally known and implemented everywhere! There are several things I am working on currently. Networking and collaboration with others who care is something that thrills me, so there are projects with others for two new brain packets, a book, and—most exciting—is a toy type product! In addition, I am beyond excited to soon announce a membership effort for all of us who care about children. This will be an extraordinary opportunity where we can connect, share, and make a real impact worldwide! It sounds like you’re quite busy! With so many things in the works, where would we find you on a typical day? It is fun for me to say that I do not have a typical day. I may be traveling to present, enjoying new locations, and meeting new people. I may be found writing at home or doing social networking with my laptop at a quaint coffee shop. My favorite place to be is outdoors (in warm weather). Any chance I can get to do writing and creating in a natural setting is my absolute favorite. 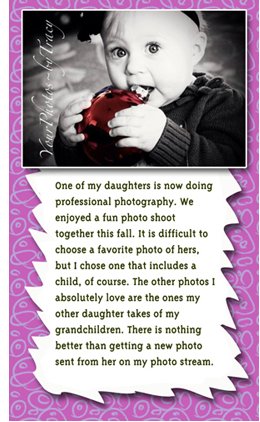 However, as much as I love to have creative time, spending time with family and friends (and my special grandchildren!) always tops the list! It’s easy to see that you are knowledgeable and passionate about helping children learn and grow with the best possible support. What else should we know about you? As a fun fact about myself, my mother’s side of the family is related to the man who sculptured the Statue of Liberty! We have a family golf tournament every year called The Liberty Open. An interest that I have but have not ever pursued formally is photography. I especially enjoy taking photos of sunsets. If it is a sunset over the ocean, all the better! What’s on your bucket list, career-wise or personally? I love to travel and, as I already mentioned, enjoy meeting people. One thing on a career bucket list is to travel to numerous countries with a brain development focus. It would be fascinating to me to gain valuable insights from each culture as to what they do best for children. This would be in addition to enjoying the beauty of the variety of locations. In addition, I hope (plan) to create a television show that will have a wonderful impact toward making early brain development common knowledge. It is already planned in my mind; I just need to make the connections with people that can make it happen. Another dream is for every baby born to go home from the hospital with a Love Your Baby brain packet. Every baby wants the adults in his or her life to understand what is needed most! Learn more and see a full list of titles by Deborah McNelis.